Wednesday: 55 minutes on grass fields…picked it up to sup 6:00 pace over the last 15:00. Thursday: 50 minutes on turf fields at Garrison Forest School (worked down to 5:40s)…last 10 minutes were barefoot. 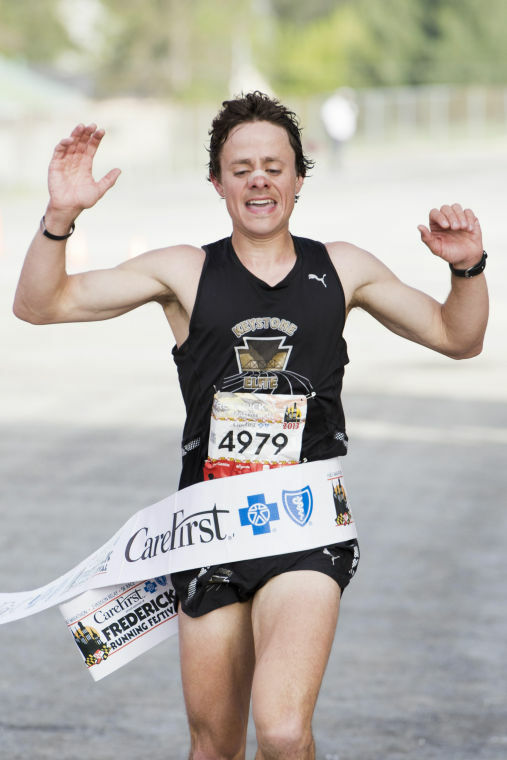 Sunday: (RACES) MCVET 5k/10k (5k at 7:00 and 10k at 8:00) Race Report coming later tonight, but I ended up winning both. A couple Ethiopians came up from DC so it made the race more competitive then it has been in a few years. I ran 14:55 and 32:22. 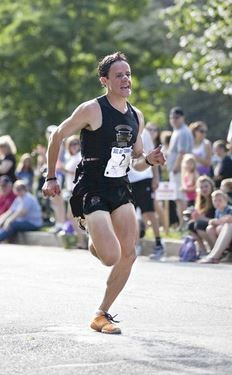 Tuesday: (Valley Centre 715 meter loop/Hill Behind Sam’s Club) 15 minute easy warm-up….6 x :12 hill sprints with 2:00 recovery jog…2 laps of Valley Centre in 2:18/2:17 (5:10–:08/mile)…6 x :12 hill sprints with 2:00 recovery jog…2 laps of Valley Centre in 2:19/2:14 (5:12–:01/mile)…10 minute cool-down. Sunday: am: 30 minutes easy with Amanda and pushing boys in double stroller / pm: 40 minutes pushing Evan in stroller while Colin napped. Saturday: (14 miles total) T. Rowe Mile Loop–3 miles easy warm-up….5 miles at 6:00-5:54-5:50-5:48-5:44…3 miles at 5:14-5:13-5:12…3 miles easy cool-down (legs felt good, but did get tired earlier than expected…looking forward to an easy week next week to get my legs ready to go at Pocono. Thursday: 72 minutes total on turf fields at Garrison Forest School (was going to leave campus and run on roads/trails, but lets were pretty sore from last nights workout) / pm: nice hike with the family! / 4 miles easy pushing double stroller on NCR Trail with Amanda (Evan rode his bike the whole 4 miles…#impressive! Monday: Off…played in snow for hours with my boys and the neighbor kids. Also ran around throwing an ultimate Frisbee around in the gym for a little while in the afternoon. Saturday: T. Rowe Price Business Park Loop…70 minutes total with 2 x mile (5:11, 5:01) with 1 mile in between…wasn’t easy, but had to get legs moving a bit again. Sunday: Shamrock Marathon (VA Beach)…Race Report here Huge thank you to J & A Racing for hosting me and my family for the weekend. This is definitely an event I will be back for in the future! Sunday: 120 minutes easy on roads/sidewalks/grass…really focused on holding myself back and running easy. I checked my pace a few times just to see how fast I was going and it was always between 6:55 and 7:05. The whole entire run felt easy and I felt like I was running much slower than I was… Finished up with 4 x :15 hard over last 5 minutes. Saturday: 40 minutes easy…pushing boys in stroller with Amanda. Thursday: am: 40 minutes easy on treadmill / lunch: 50 minutes on turf fields at Garrison Forest School. Wednesday: 43 minutes easy on turf fields at Garrison Forest School. Tuesday: am: (Valley Centre (715 meter) Loop) 5:30 am:—-15 minute warm-up….12 loops moderate….3:00 jog/change into flats…12 loops starting a little faster than marathon pace and picking it up throughout…..12 minute cool-down. 2 loops splits (actual pace in ())—5:02 (5:38)–4:57 (5:34)–4:57 (5:34)–4:55 (5:32)–4:48 (5:24)–4:49 (5:25)……….4:34 (5:08)–4:34 (5:08)–4:33 (5:07)–4:33 (5:07)–4:31 (5:05)–4:28 (5:01) / lunch: 12 minute warm-up…..16 laps continuous with first 8 moderate/8 loops harder…10 minute cool-down 2 loop splits (actual pace in ()): 4:58 (5:35)–4:52 (5:28)–4:51 (5:27)–4:51 (5:27)–4:28 (5:01)–4:29 (5:02)–4:31 (5:05)–2:12 (4:56)–2:08 (4:48)…was able to finish strong, but definitely had to push and focus to maintain pace over the last 5 laps. Saturday: 136 minutes on rolling hills (roads/sidewalks)….I checked my pace several times throughout the run and it was always between 6:30 and 6:50. The pace of the run felt easy, but I was definitely feeling the effects of my glycogen stores not being back to normal from Thursday’s workout over the last 30 minutes or so…..that was the point of this long run! Monday: 60 minutes total. 40 minutes on turf fields at Garrison Forest School…..20 minute weight session….20 more minutes on turf fields. Saturday: 50 minutes easy on turf fields at Garrison Forest School. Back is still acting up and more focused on the left side. I started doing a lot of glute strengthening that I slacked on lately and it seems to be working great. I also noticed that it seems like my left psoas is in spasm/tight….so I’ve been working on that as well. Friday: 22 miles total 15 minute warm-up….18 miles at 5:40-30….15 minute cool-down. Planned to do 20 mile progression (at Valley Centre) as 6 at 5:50–>5:40, 6 at 5:40–>5:30, 6 at 5:30–>5:20, 2 HARD. My low back went into spasm at around 2.5 miles into the run (first 2 miles were both at 5:40). I stopped and stretched for a minute and then decided to go out on the roads and just get in a longer run…5 minutes later my back started to feel better and I picked it up again. I ran out on roads for 50 minutes before returning to Valley Centre parking lot to finish the rest of the run. I checked my pace 3 different times out on the roads and it was always between 5:35-5:40. After returning to Valley Centre I ran the rest of the run at 5:35—>5:30 with the last 1/ 2 mile at 4:50 pace. Thursday: 81 minutes on golf course at Greenspring Valley Hunt Club. Wednesday: 50 minutes easy on turf fields at Garrison Forest School. I would call this week a “solid” week of marathon training. I was able to get in some work, but spent most of the week recovering from last Sunday’s 29 mile run. Saturday’s workout wasn’t spectacular, but I still got in the work. I used map my run and the loop I run at Valley Centre came out between 715-720 meters every time I measured it. What does that mean? It looks like 2:20/lap would be around 5:15/mile. 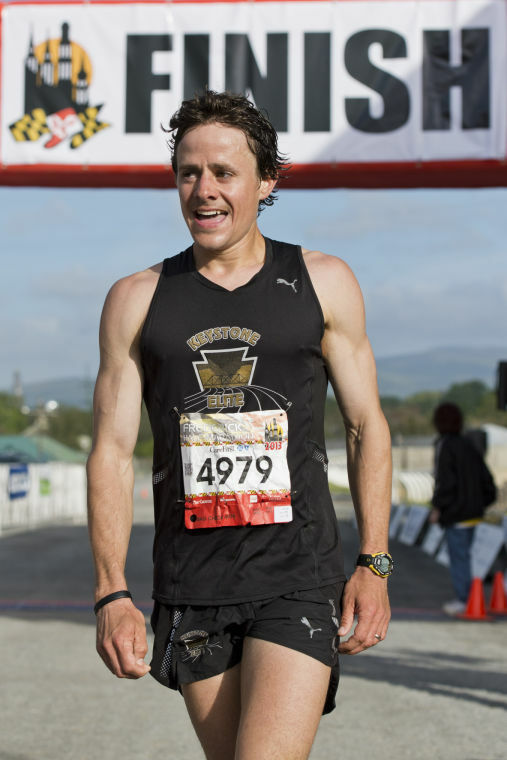 I like that I now have an idea of the pace I’m running….it makes the workout this past Saturday one that started out around 5:25/mile and went down to 5:15/mile. I’ll take it in the wind and being tired. Friday: 50 minutes easy on turf fields at Garrison Forest School. Thursday: am: short (20:00 weights session) / 91 minutes on golf course at Greenspring Valley Hunt Club. Tuesday: 45 minute jog on turf fields at Garrison Forest School. Saturday: 67 minutes on golf course at Greenspring Valley Hunt Club. Thursday: Lunch: 40 minutes easy on turf fields at Garrison Forest School. Pm: 40 minutes on spinning bike. Tuesday: 60 minutes on turf at Garrison Forest School. 12 x straightaway hard…starting at 12:00 I ran a straightaway hard every 4:00. Monday: 50 minutes easy on Greenspring Valley Hunt Club golf course. 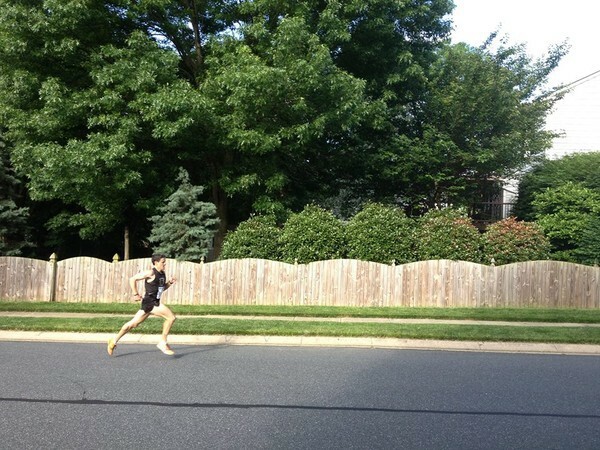 3 x :20 hard over last mile to get legs turning over. Sunday: Off…felt like I needed a day off. Was great seeing the Ravens win and make it to the Super Bowl. I know I’m truly a Giants fan, but it is nice to see our local team in the Super Bowl. It’s amazing what it has done to the city. Go Raven!!! Saturday: (T. Rowe Price Loop) 16 miles total….12 of it at 5:45–>5:34. Tired by end, but expected…tired from Thursday. Thursday: (Valley Centre Parking Lot Loop) (3 mile warm-up/2 mile cool-down) 20 loops alternating 2:18-2:20 with 2:35-2:40. I felt really strong the whole time. My knee has definitely still been a concern. It does not feel right and it is definitely swollen. It’s different from other injuries as the swelling just feels like pressure within the whole entire joint and it loosens up as I run. Wednesday: AM: 91 minutes on roads/sidewalks…out by 5:15. Raining and COLD!!! / Lunch: 30 minutes on elliptical machine…was going to run on the treadmill, but with how my knee has been I thought the elliptical would be better. It’s been a solid week of training. Other than my left knee flaring up everything went fairly well. I did my Wednesday workout on a non-measured course again, but it was a lot better than the week before. I definitely think I was sick last week, but I also started taking iron supplements again. I’m excited for the coming weeks! Wednesday: (Valley Centre Parking Lot Loop) 8 x 2 loops with 1:00 recovery. (4:54/4:53/4:54/4:52/4:52/4:47/4:43/4:33 (last lap in 2:13)) I would say that I ran the workout at around 15k effort. Big jump from last Thursday’s workout on the same loop. Tuesday: 50 minutes on turf fields at Garrison Forest School. I ran a straightaway hard every 4:00 starting at 10:00….giving me 10 total. It’s been a rough week. I don’t know if I have an underlying cold/sickness or what, but the runs/workouts felt really hard. I’m also going to start taking iron supplements again. Low iron is a chronic issue that I have been dealing with for years. If I stop taking supplements for any extended time my levels go down fast. I purposely did Monday’s and Thursday’s workouts on unmarked courses so I didn’t get discouraged by the actual pace I was running….maybe I should have done the same thing on Saturday. I also have to stay on top of my left achilles. It’s minor right now, but if I don’t take care of it I can see it getting worse. I’m going to start doing a lot of eccentric calf work…something I should do all of the time, but get lazy! Sunday: 30 minute jog (in dark) on turf fields at Garrison Forest School (last 5-10 minutes barefoot) Left achilles noticeable… (Amanda brought the boys down to run around and play while I was running. I loved it! 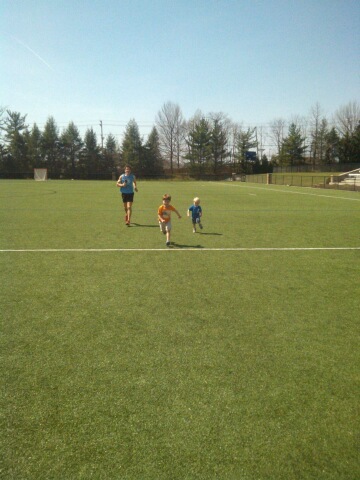 Evan kept asking me to slow down so he could run full laps with me. He definitely got in over a mile and didn’t want to leave….) 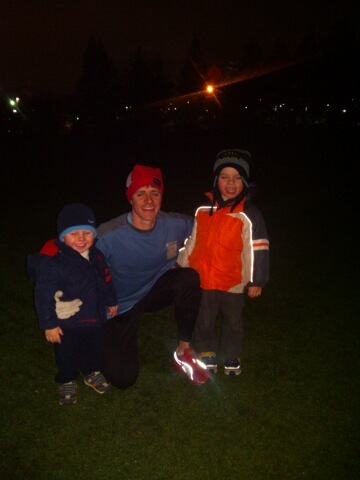 Here is a picture of us on the turf…not the greatest quality, but I like it! Friday: ~ 7 miles with my buddy Chris Chattin in Ellicott City, MD. Left achilles is sore…. Chris and I went to Judges Bench for dinner and great beers after our run. (If you’re ever in Ellicott City you should check it out. Their beer selection is amazing! Wednesday: woke up feeling like crap…whole body was sore. Struggled through a 35 minute run on Greenspring Valley Hunt Club golf course. Was planning to try and get in 70 minutes….body wasn’t letting it happen. Tuesday: 50 minutes easy on turf fields Garrison Forest School with last 5-6 minutes barefoot.